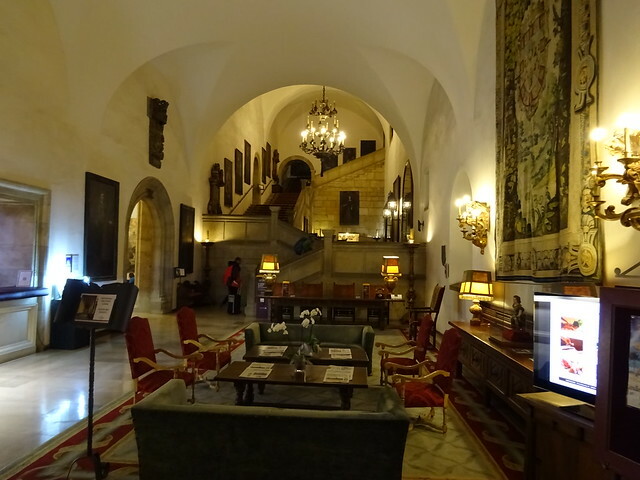 The luxurious Hostal San Marcos in Leon was worth a splurge. Maybe next time! 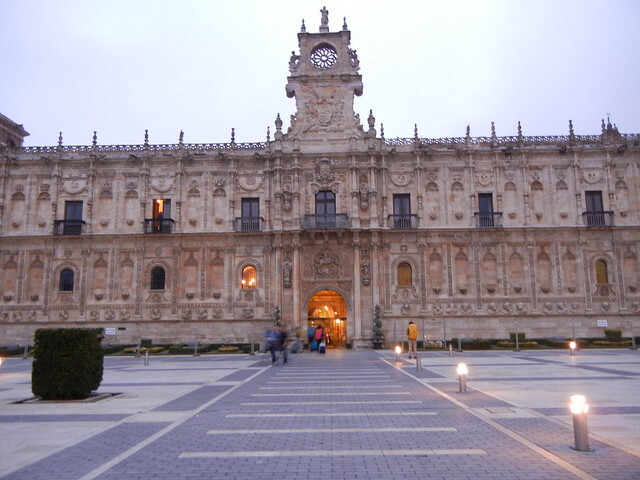 This stunning building was built in the 16th century as a convent, but the building also has a dark history. During Spain’s 1936-39 civil war, thousands of opponents of the future dictator Francisco Franco were imprisoned there and many were killed. This hotel might be better known as the one where Tom and his three friends stayed in the movie, “The Way.” As non-paying guests, we weren’t allowed to wander through the halls of the hotel, but we were able to have a quick peek at the impressive lobby, adjoining rooms, and beautiful stairway. Back out in the Plaza San Marcos, we met Australian author, novelist, and tour guide, Garry McDougall. 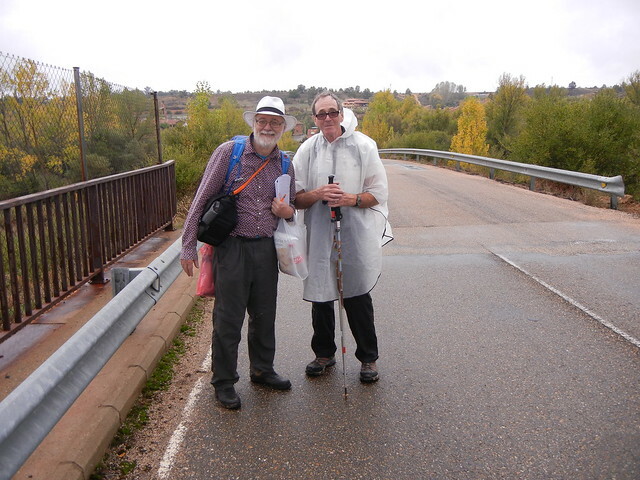 He was just starting to walk the Camino today from Leon. His flight arrived in the wee hours of the morning and, because there were no vacancies in the city, he had no other choice but to sleep on the street. It wasn’t an ideal start to his journey, but he seemed to be in good spirits anyway. 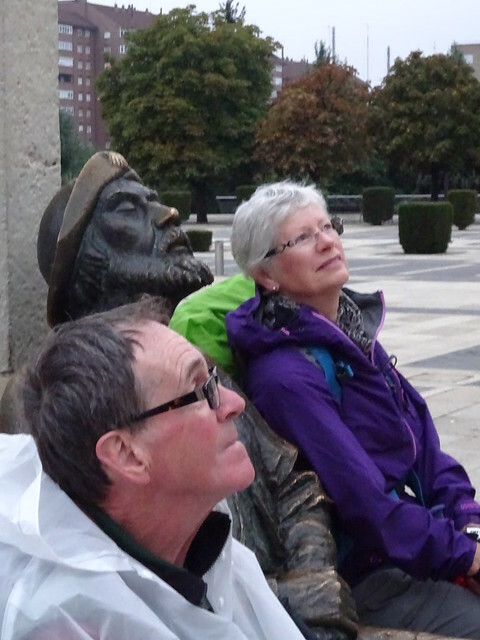 Garry walked much of the Camino when he guided groups, but he has never walked it on his own. The experience will give him material to write about. It won’t be a travel guidebook but something else entirely, perhaps something historical from a peasant’s point-of-view. He is knowledgeable about historical facts pertaining to such things as the Knights Templar, and I’m sure we’ll learn more from him as long as we keep the same pace. 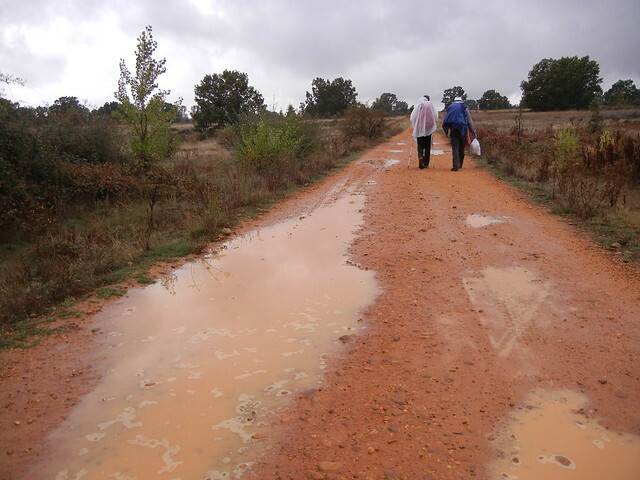 The route today was relatively isolated and part of it was muddy since it had rained. It might have been because of the mud that many peregrinos chose to take the alternative route along the highway. The mud didn’t stop us, though, even if it did mean we had to do a load of wash later! We settled into the first albergue we came to in Villar de Mazarife, San Antonia de Padua. It has fifty beds in one room, but our room is private with a shared bathroom. It is clean, quiet, and comfortable, has a large sitting/dining room and a cozy wood stove. This is one of our favourite places. We were on our way out to find the bar and discovered Garry on his knees, digging through his belongings, and looking for his wallet. The last time he remembered having it was two hours before at a bar in the last town he’d walked through. He was able to get a drive back, and there was his wallet on the floor under the table where it had fallen. He had no idea what he would have done if it was gone – and this is only Day 1 for him! When I suggested those Camino angels must have helped him out, he accepted it as a good possibility. 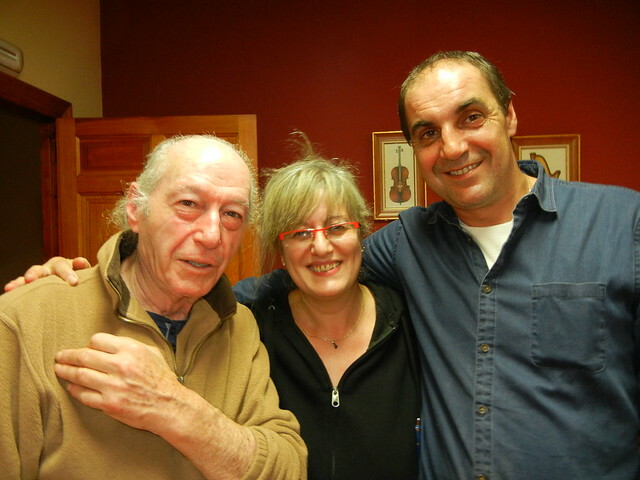 The owner of the albergue, Pepe Giner, is dedicated to the pilgrim way and made it so special tonight. He provided us with an amazing experience that was on the top of my Camino bucket list: A Queimada ritual. Queimada is a Galician tradition transmitted along generations. It is made of Orujo Gallego, a spirit distilled from wine and flavoured with special herbs or coffee, plus sugar, lemon peel, coffee beans and cinnamon. It is traditionally prepared in a hollow pumpkin. Pepe made it in a ceramic basin. Pepe explained all that he was doing in Spanish while Beth from California translated it for us. We gathered around while Pepe recited an incantation so that special powers are conferred to the queimada. The goal is to distance the bad spirits that lie in wait for men and women to try to curse them. Then he set the queimada alight and the lights were turned off. The queimada slowly burned as more Orujo Gallego was added. The burning liquid was lifted in a ladle and slowly poured back into the container. The flames must have almost touched the ceiling! All occasions are good for a queimada: a party, gatherings of friends, etc. After dinner, in the darkness of night, is one of the best times for it. The tradition also says that one of the perfect days to make the spell of queimada is on the Celtic New Year’s Eve. However, typically the Queimada ritual takes place during St. John’s night or “witches’ night” on the 23rd of June. This was our Canadian Thanksgiving – as good a night as any! Chadow and I caught up on your blog again today – had to trade her for the computer so I can type! Your blog was the buzz at the Walking Group coffee in the sunshine at the Roost even though you are not a member of this group. You are touching so many people with your blog and everyone is enjoying your writing and pictures so much. Tanya gave her talk at the Newcomers’ lunch last week. Hope all is still going well and continues to do so for the last half of the walk. Everything is going well here, aside from Dave’s latest injury. He didn’t hurt himself walking but getting himself out of a four-foot bathtub that he should never have gotten himself into in the first place. LOL!